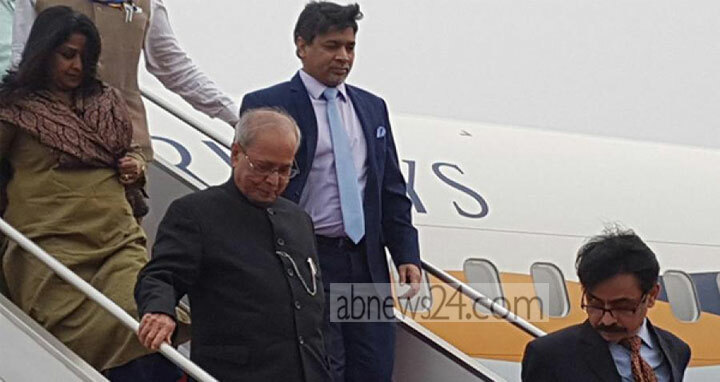 Dhaka, 14 Jan, Abnews: Former Indian President Pranab Mukherjee has arrived in Dhaka to attend a number of programmes, including the closing session of the 'International Bengali Literature Conference' in the city. Foreign Minister AH Mahmood Ali and Indian High Commissioner in Dhaka Harsh Vardhan Shringla received Pranab at Hazrat Shahjalal International Airport upon his arrival on Sunday afternoon, UNB reports. Pranab’s daughter Sharmista Mukherjee, among others, will accompany the former Indian President during his Bangladesh visit. Prime Minister Sheikh Hasina inaugurated the three-day literature conference on Saturday at Bangla Academy while Pranab will be present at the closing ceremony of the conference on Monday as the chief guest. He will meet Prime Minister Sheikh Hasina at her official residence Ganabhaban on Monday, who will host a lunch in his honour. Pranab will also visit the Bangabandhu Museum to pay respects to Father of the Nation Bangabandhu Sheikh Mujibur Rahman on Monday morning. He would visit Chittagong on January 16 and join the CU convocation. The university would confer an honorary doctorate degree to the former Indian president. That day, he would also pay a visit to home of Masterda Surya Sen, an influential leader of the Indian Independence Movement. The following day, he would return to Dhaka and join a dinner at Gono Bhaban hosted by Prime Minister Sheikh Hasina. He is scheduled to fly back to India on January 18.